The 4-star Hotel Manzoni is located in the fashionable shopping area of Via Montenapoleone, is a 15-minute walk from the the Sforzesco Castle. It offers a well-equipped fitness area, plus elegant rooms with free WiFi. All decorated with refined wood floors, rooms at Manzoni Hotel feature an LCD TV, along with a minibar and an elegant private bathroom. Restaurant Don Rodrigo offers a small environment where you can taste Italian cuisine and international specialities. Milanese dishes and the best Italian wines are also available. The wellness area is complete with a modern fitness centre, Turkish bath and hot tub. The Manzoni is a 10-minute walk from Milan’s Cathedral, the Duomo. Montenapoleone Metro Station is just 250 metres away. Milan Linate International Airport is 7 km from the property. Valet parking is available without reservation. When would you like to stay at Hotel Manzoni ? This elegant room features wooden floors, a marble bathroom, LCD TV and free Wi-Fi.Please specify bed preference when booking. This room cannot accommodate extra beds. 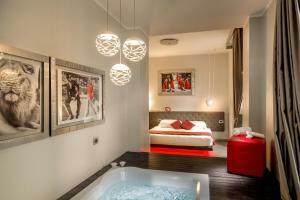 This elegant room features wooden floors, a marble bathroom, LCD TV and free Wi-Fi. Some have a balcony.Please specify bed preference when booking. This room cannot accommodate extra beds. With exclusive décor and a comfortable sofa bed, the elegant junior suite features wooden floors, a marble bathroom, LCD TV and free Wi-Fi. Guests can also enjoy a complimentary Nespresso coffee machine and capsules.Please specify bed preference when booking. Upon request and availability, 1 extra bed can be accommodated free of charge. The spacious suite is elegantly decorated and offers a comfortable sofa bed and a luxury marble bathroom. 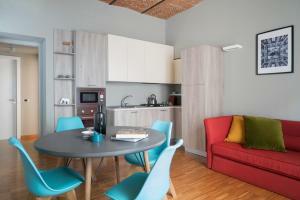 It features wooden floors, an LCD TV and free Wi-Fi. Guests can also enjoy a complimentary Nespresso coffee machine and capsules.Please specify bed preference when booking. Upon request and availability, 1 extra bed can be accommodated free of charge. Elegantly decorated room overlooking the hotel’s internal courtyard, this room features wooden floors, a marble bathroom, LCD TV and free Wi-Fi. It has a small double bed (120 cm wide). When booking 5 or more rooms, different conditions and additional supplements may apply. Each day we'll check prices and send you an email for your selected dates at Hotel Manzoni. If you don't have specific dates but would like to check prices for say next weekend or say next month we can check the price too. Click to write a review and share your experience of Hotel Manzoni with other travellers.